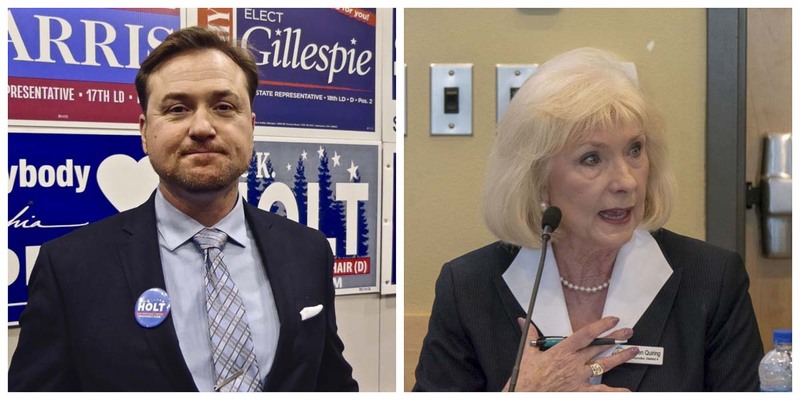 CLARK COUNTY — With an estimated 7,000 ballots still to be counted, the Clark County chair race still remains a tight one, but it’s becoming much less likely that Eric Holt will pull out a miracle. As of Friday night, Holt trailed District 4 Councilor Eileen Quiring by 1,680 votes. Still less than a full percentage point of difference. On Thursday evening, Holt said their campaign was prepared to push for a recount if the margin remained as close as it was. Holt’s campaign has not responded to a request for comment on Friday’s results. Quiring, who trailed Holt by over 1,200 votes on election night, said she attended an event at Cathedral Tapatia put on by 17th District Representative Vicki Kraft whose opponent, Tanisha Harris, conceded the close race on Thursday night. But later that evening, Quiring says she got a boost of morale from a few people who said history was on her side. “I got a couple calls … that said ‘Eileen, you know, you just need to know the history. It will trend your way when they start counting more votes, and later votes,’” Quiring tells ClarkCountyToday.com. One example she was given was 2008 when Republican Tom Mielke beat Pam Brokaw by just over 200 votes, after trailing by 4,500 votes on election night. “That wasn’t the way it was for me in Oregon,” says Quiring, referring to her time in the state legislature there. State law in Washington calls for a mandatory recount if the difference between two candidates is less than one-half of one percent and also less than 2,000 votes. While the county chair race is separated by fewer than 2,000 votes currently, it is more than one-half of one percent. If the final tally is outside of the mandatory recount margin, the losing campaign could request a recount, but would be required to pay for the recount. That would include a deposit of 25 cents per ballot cast, for a manual recount, or 15 cents for a machine recount. If the results of the election were overturned, the county would refund the campaign for the cost of the recount. The next release of ballot counts is expected Tuesday evening, because Monday is Veteran’s Day, a Federal holiday.